Irish Trivia: Can you answer all 20 questions? Here at EC Boston, we are blessed by having an Irishman as one of our Student Services Coordinators, Stephen! For St. Patrick’s Day, he came up with a quiz for our students. The winner will get a mystery prize which will be announced at our graduation on Friday. Do you think you know a lot about Ireland? Can you understand people with Irish accents? Try our quiz, the answers will be posted to the blog on Monday. Which famous actor is from Ireland? Who was the first American president of Irish descent? Which sport originated in Ireland? Which famous rock band is Irish? How many counties are in the Republic of Ireland? Which Boston sports team is Irish-themed? What are the official languages of Ireland? Which movie was filmed in Ireland? If an Irishman approaches you and says “Ey what’s the craic boy?”, how would that translate into American English? When are you leaving my house? If an Irishman says “I’m absolutely knackered”, what does that mean? He is very excited for the soccer game on Friday. He is very energetic and wants to go for a run. He has had a bit too much to drink. He is very tired and wants to go to bed. If an Irishman says “I’m grand, grand all together,” what does that mean? I’m horrible, leave me alone. I’m hungry, give me food. I’m thirsty, I really want a beer. If an Irishman says “Let’s go for pints shall we?”, what is he asking you to do? He’s asking you to go to the pub with him. He’s asking you to marry him. He’s asking you for directions to the bus stop. He’s asking you to get him milk at the shop. If an Irishman says “That’s gas!”, what does that mean? If an Irishman says “what’s the story?”, what is he asking you? Can you read me the story? If an Irishman says “Ugh, Mick is so thick,” what is he saying? Is an Irishman says “my oul fella,” who is he referring to? If an Irishman says “Stephen’s a fine thing,” what does that mean? 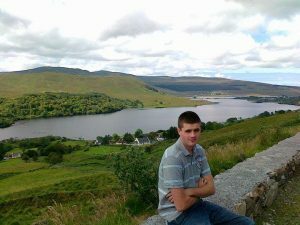 Do you want to learn more about Irish culture in Boston from Stephen? How about just learning English in a multicultural city such as Boston? Head on over to our website where you can learn more about learning English in Boston.